Feel free to direct your question to the guest you want to answer. If you don’t, we’ll choose for you. As always, keep it respectful and fun. Ivor Cummins completed a Chemical Engineering degree at UCD in 1990. He has since spent over 25 years in corporate technical leadership and management positions and was shortlisted in 2015 as one of the top 6 of 500 applicants for “Irish Chartered Engineer of the Year”. Ivor’s focus and specialty is leading teams in complex problem-solving scenarios. He has often led worldwide teams with over 60-70 engineers working on major technical issues; the largest of these involved product issues where hundreds of millions of dollars were in the balance. Several years ago, Ivor encountered a complex technical challenge in his personal life. Receiving poor blood test results, he was unable to get solutions via the doctors consulted. He thus embarked on an intense period of biochemical research into the science of human metabolism. Within eight weeks he had resolved and optimized all of his blood test metrics. Also, he had shed over 15Kg of bodyfat with relative ease. In the following years he continued his research on the many “root causes” of modern disease, from “cholesterol” through to insulin resistance. He has become a professional speaker of note, giving many public lectures and chairing interviews with worldwide health experts. Most notably he was invited by the President of the British Association for Cardiovascular Prevention and Rehabilitation (BACPR) to give a keynote talk on heart disease root causes, at their annual conference in London last October. All of Ivor’s public lectures and interviews are available on his YouTube channel, where nearly a million views have been recorded to date: https://www.youtube.com/channel/UCPn4FsiQP15nudug9FDhluA. At his core, Dr. Joel Kahn believes that plant-based nutrition is the most powerful source of preventative medicine on the planet. Having practiced traditional cardiology since 1983, it was only after his own commitment to a plant based vegan diet that he truly began to delve into the realm of non-traditional diagnostic tools, prevention tactics and nutrition-based recovery protocols. These ideologies led him to change his approach and focus on being a holistic cardiologist. He passionately lectures throughout the country about the health benefits of a plant-based anti-aging diet inspiring a new generation of thought leaders to think scientifically and critically about the body’s ability to heal itself through proper nutrition. One of the world’s top cardiologists, Dr. Joel Kahn has treated thousands of acute heart attacks during his career. He’d like all that to stop. He’d like to prevent ALL future heart attacks by breaking through to the public to educate and inspire a new holistic lifestyle. Now is the time to focus on educating the public to eat clean, sweat clean and apply cutting edge science to their lifestyle. Question for Ivor: What tweaks would you make to a Keto / LCHF diet for someone with Familial Hypercholesterolemia? Question for Joel- Nicotine in and of itself is not so bad for you, infact, it has some benefits if you dig around; the issue being the delivery of said alkaloid usually comes in the form of a cigarette, which is obviously horrible and brings with it loads of toxic garbage. We know meat has many bioavailable nutrients, my question is what comes along for the ride with meat that you find to be a problem for humans… all ethical reasoning aside. Question for Ivor: What’s your opinion on LCHF/Keto and saturated fat for APOE4? Also, what’s your APOE-genotype? Question for Ivor. Testing negative for FH does not rule out many genetic snps that lead to a less than desirable phenotype for cholesterol synthesis eg high ldl p and small dense ldl, despite eating real nutrient dense low carb, higher fat ancestral foods. Would it be advisable for these folks to have higher carb or lower fat in hopes to improve these markers, despite all other labs improving? Many Thanks. Question for Joel: With regards to fat, the WFPB-community advocates to exclude oils as they are not a whole food and studies show that even “healthy alternatives” such as olive oil cause endothelial damage. However, in the LCHF/Keto-community, people use oils liberally without concern. What do you think about this? 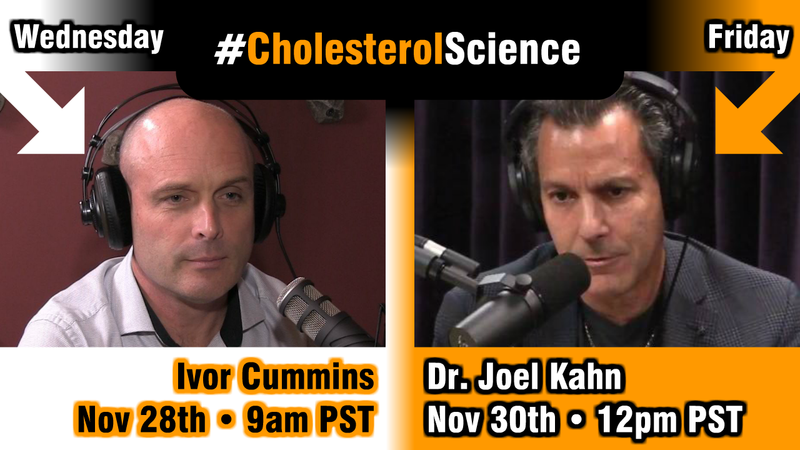 Question for Joel: Apart from heart disease, what is the main concern you see with being a hyper responders? For both gentlemen . How would a person on a Whole Foods plant based diet (vegan) with a high cholesterol reading lower their choloseterol without medication . Taking into account a healthy diet, six days of weekly well rounded exercise and a healthy weight . In this case is a high cholesterol reading still a risk factor as it would be for someone who is not leading a healthy lifestyle ? Dr Kahn: Based in your previous interviews and statements I’ve to ask if you’ve ever tried to stick to a “high animal based” diet yourself to measure your response in terms of health and wellbeing for claimings other than LDL levels.